Destination advice, travel tips, and adventures with a carry-on bag. I found myself in Baltimore, Maryland this past autumn for the wedding of two close friends. I arrived a couple days early in order to spend a little bit of time exploring "Charm City" before the big event. I wanted a hip, affordable, centrally-located place to stay and the Hotel Red Lion (RL) Baltimore ticked all of those boxes. I was first exposed to the Spokane, Washington-based Red Lion Hotels Corporation and its RL brand while attending NYTravFest last year. There are currently 39 Red Lion properties in the U.S. and Canada. The rooms at the Hotel RL Baltimore are basic yet comfortable. The quality is similar in style to a DoubleTree, yet its pared-down amenities might make it feel like a nice Best Western. All units overlook the streets and office buildings of downtown Baltimore. The windows are large and have blackout blinds (along with sheer fabric blinds). Though there are ample outlets and USB charging ports in the room, there are no coffee makers nor mini-refrigerators. The bathroom door is a sliding glass door. It's convenient, but does not provide much privacy. Active travelers will make good use of the free bicycle rental. The staff at the Hotel RL Baltimore left me with a great impression. They accommodated our midnight check-in and request for late checkout. They also offered secure luggage storage while I went for a haircut and was in-between accommodations. The cafe at the hotel is open for breakfast and each stay at the Hotel RL Baltimore includes a free coffee. The Hotel RL has an event space (where they host live performances). There is also a game room on premise. The public spaces were open and inviting. They felt like an ideal spot to work from for an afternoon. The hotel is located within walking distance of the most touristy parts of Baltimore, including the Inner Harbour and Camden Yards. The picturesque Fells Point and Federal Hill neighborhoods are only a short Uber ride away. 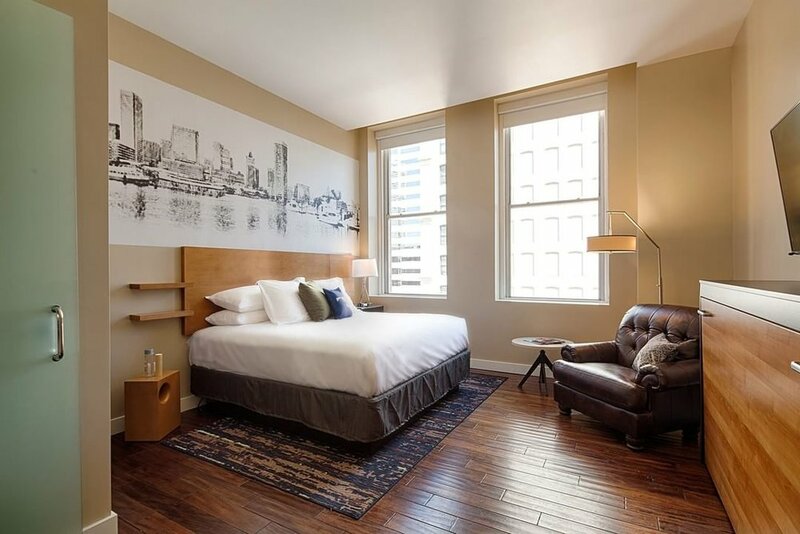 Hotel RL Baltimore is located in downtown Baltimore, Maryland. One Carry-On is a blog managed by Marie Frei, a travel expert and photographer with a passion for exploring off the beaten path locations. The blog covers honest and personal stories about living and traveling as an American abroad, shares her global appreciation for culture and design, and promotes traveling to far-flung destinations with a carry-on as fun, affordable, and easy. One Carry-On is a travel and photography blog by Marie Frei, a Brooklyn-based content creator who specializes in producing dynamic stories for boutique brands.